1 each Yeast Nutrient1 each Yeast Nutrient Fining Boil 10 min. Aerate the wort with pure oxygen or filtered air and pitch the yeast. Ferment at 20c˚"10/15 days"
Curious, isn't 10°C (50°F) for fermentation a bit cold? AnteK, I see in the hop recipe it calls for 50g of Citra, but in your notes at the bottom i see 70. Should it be 70g for Citra? Hi AnteK! Noticed in your recipes that you mention 25L for boil size, but then say 28L of total water. Do you start with 25 or 28? Thank you from the East Coast of the USA! Good Question! Sometimes I start with 28l and sometimes 25l and 3l of Sparge. I prefer the first option! How long do you dry hop for the second time? Isn't 79 dergees C a bit high for mash out? ... might be an automatic generated conversion. Between 75 and 79˚C if fine, actually 79˚C is the limit. As the vessel has controlled temperature is ok do not run the risk of passing .... But it is more prudent between 75 to 78˚C. About your calculation, depends of your efficiency. In my process is perfect! This is my first brew as a beginner. I'm using a grianfather and it's time to fill up the bottles tomorrow. I have learned a lot during the last weeks and I realize that I did a few errors. Hi, would you recommend doing a secondary fermentation and if so how long before I transfer? My second question, should my first dry hop addition ( 50g Simcoe) be added during primary fermentation (after 3 days) then finish with the 2nd dry hop during secondary with about 5 days remaining or until stable gravity? 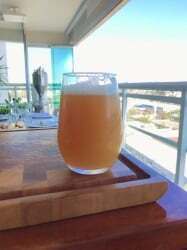 I am relatively new to brewing so any help is much appreciated. Hi Antek, how are you? In previous batches using Oat, I've found that the more i put, the less circulation I get, having efficency problems over 200 grams. (I usually force the total capacity, and use around 6,4 kg of malt). Not a problem without Flaked Oats.